The rumours had cornered us with anxiety and apprehension. Expectations of hungry children tarnished by their grim environment had suppressed our excitement to a feeling of vulnerability. Upon arrival, we were exposed to the stern nature of the airport staff, the stiffening cold, a language that seemed nonsensical and currency ridiculed by a crumbled economy. We now felt more vulnerable than ever. Arrival into the country required the endurance of a gruelling inspection of all necessary documentation. Once this was complete, we met our interpreter. This was the turnaround point. Unlike an Irish airport in the summer months, Minsk didn’t seem to have much happiness. No excited kids. No middle aged men in socks and sandles. No stressed mothers in maxi dresses. However, the warmth we were greeted with upon meeting Irena was second to none. Her caring nature radiated immediately, and suddenly we could release some of our emotional armour. The driver was equally as welcoming, chuckling at our reactions to the -20 degree cold. The drive to the orphanage lasted 2 hours. As we drove, we gradually began to appreciate the beauty of the winter wonderland through which we had the privilege of travelling. We were informed that some of the older kids were waiting up to see us. As we took our first step out of the minivan, we saw the first faces of amazement gazing out of a window on the second floor. It was dark, and the lights were off, but the smiles and bright eyes could be seen nonetheless. There was a sudden realisation of what we were about to take part in. We were not volunteers, or workers, or anything else. We were the “Irish girls”; superstars. For the duration of the 2 weeks that followed, what we wore didn’t matter, what we looked like didn’t matter, how we spoke didn’t matter, how much money we had didn’t matter. A smile was granted by our presence. Nothing else was necessary. It may seem that the work we done was incredibly difficult. However, your personal economy is dependant solely on what you value. These children placed enormous value in a hug. A hug to them is an iPad to most Irish children. They are wealthy, not in money, but in happiness. We spent our days dancing, playing simple games, feeding, hugging, and sometimes just sitting with the children. The walls were covered in murals and pieces of art made by the children. The food was nutritious and plentiful. The children smiled, laughed and danced. It was so far from our expectations. Granted, it was emotionally taxing at times to feed a “child” older than oneself. 20 year olds shouldn’t be in cots, nor should they be confined to 4 walls. But for the most part, they were happy. This is what most people don’t understand; the orphanage is their world. It’s home. It’s where all their happy memories are. They are protected, fed, looked after, and spend every day with their friends who they have grown up with. There are no daunting social standards that hover over each individual, forcing them down a path governed by expectations. The perceived satisfaction the kids have within the orphanage was reinforced by Vitalek (26 years old), who when we asked if he would like to travel responded with “No, here is home”. As I sit here in the University library, I have a camera, an iPhone and an external hard drive on my right, a laptop in front of me, and a wallet on my left. These items may contribute to some of my happiness, but I assure you there are far brighter smiles in Gorodische right now. If anyone has ever considered doing something like this, I really do encourage you to do so. This was a life changing experience for those of us that travelled. It won’t be the last we see of Gorodische; this is only the beginning. 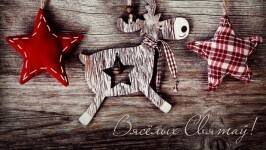 Charity "Dobra tut" wishes you a Merry Christmas and a Happy New Year! We wish you lots of happiness good health and all the best! May the new year bring you many pleasant meetings and may all your wishes come true! We would also like to thank everyone, who supperted us this year, our wonderful partners Burren Chernobyl Project and Chernobyl Children's Trust, as well as the amazing volunteers! We are sending you our love! His main diagnoses are CP, spastic quadriplegia, slow learning development. “Our boy was born healthy, but on one of the first days, apparently because of the vaccination he had a blood stroke that caused major damage to the boy’s health. Arsenyi is 4 now but he doesn’t walk, although he can crawl and has good chances to progress. During these 4 years we have done courses of rehab in Belarus, Check Republic, and 2 courses in Chine that gave him the best push in his development. At home on a daily basis we do phycio, massage courses, horse riding. But best results of course were achieved in China. For a child that was considered to be not prospective in our country he did miraculous things like started crawling and walking with support. Also his mental development improved greatly. The clinic in China (“Angel’s children”) has invited us for the next course in March of 2016. Total amount for the 3 month course makes 13.454 dollars (if including tickets and living costs it’ll come up to 15.300 dollars). Taking into consideration the rate changes we have to fundraise 10 000 dollars (as you see, we have already have some money). That’s why we apply to youto help us fundraise the rest. For an average Belarusian family this amount is unbelievable. But we do hope, there will be some good people who will support us financially and spread the information. We will appreciate every little help that will get our child closer to a better life. 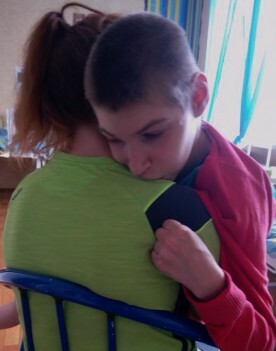 Payment purpose: for treatment of Arsenyi Selitskyi, charity account opened on his mother’s name Selitskaya Marina. We keep getting new requests from families. This time we are asking you to help this lovely girl who has quite good chances! 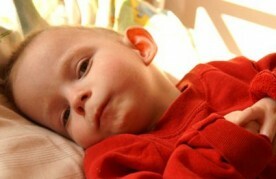 "When Vlada was 1 year old she was diagnosed with CP. From the very childhood she undergoes rehabilitation courses in a centre. At home we also do physio and massage and horse riding. It brings results but not huge. Thus we decided to bring her to an Israel rehab centre for assessment and treatment. 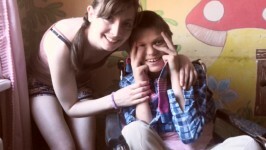 Vlada is a very clever child and she’d love to learn to walk independently. We would be very grateful for every help". 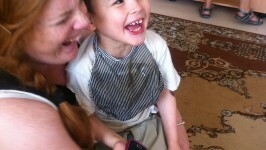 The family hopes that the rehab will significantly help the child! Total amount including travel costs, accommodation, assessment and treatment made 12 426 US dollars according to the invoice from 30.09.2015. The documents from the centre as well as the banking details are given as photographs. We thank everyone for your precious support! "I was so so excited to return to Belarus this year. At this stage it’s like going home, to visit friends and family . . . a very very big family!! It was my longest trip yet but it flew by. Four weeks with these amazing children and young people just isn’t enough. Each year they surprise me with unconditional love and happiness. This year was no different. I’m delighted to report that there were some huge improvements to be seen and although there were some difficult times, on a whole it was a very positive trip. It was great to meet so many new volunteers over the few weeks, from bringing my friends out for their first (of many, hopefully!) visit to Belarus to joining forces with volunteers that travel annually and also spending time with volunteers and locals from Chernobyl Children’s Trust. I was so fortunate to travel with so many hard working volunteers who put in long days jam packed with activities for all the children. Each day we’d be up and ready to go bright and early and we’d keep going till late at night. There was a fantastic programme of activities for the entire summer set up in Gorodishche Orphanage by some of the staff. Each day had something different from sports to concerts and trips to the lake. On the days that it was too hot to be outside we would take them to the indoor hall for games. It was brilliant to know that even if the Irish weren’t there or if we were with another group, so many of the groups were taking part in these daily activities. We got the little ones in cots and chairs outside as much as possible for walks (and sometimes even a sneaky ice-cream!). Spending time with them away from their groups for some peace and quiet but also some much needed one on one time. Singing, playing music, doing hair and makeup, playing simple games, sensory play, bubbles, cuddles, or even holding a hand can brighten these children’s days. On cool days we were able to take some to the small gym. We took the bedbound out of their beds for massages. We had beautiful sensory play items handmade by one of the volunteers, with fairy lights, tinsel, glitter, different textures, noises and smells that all went down a treat – with the Irish as well as the children! It was great to see so many of them growing bigger and stronger and in such good form. The teenagers and young adults were in mighty form. Thanks to the summer activity programme. We played soccer with the older boys most nights to give them some down time after working hard on the farm or on the grounds all day. We would treat them to orange juice and bread and jam too. We went on four trips over the course of my stay; Our morning at the lake was brilliant. It was about a 20 minute walk from the orphanage and we brought 30 teenagers and a picnic with us. A very tame few minutes of paddling and a light game of pass soon turned into a full blown water fight. Nobody was safe, we all got soaked. It was the most fun I’d had, to see them so utterly free and happy. J A very hot day led to a completely spontaneous “Can we bring them for ice-creams?”, and so we did. We brought one of the groups up to the village for an ice-cream. It sounds like nothing but it was such a treat for them, they were delighted. We travelled to a crystal factory with a group of 25 for a day. It was quite a journey but it was lovely to be able to bring them to somewhere new and interesting. The children loved it but probably loved the bottles of coke they got even more!! J It was a brilliant day out complete with our trusty picnic and ice-creams. We also brought a group to Baranavichi, the big town nearby. Here we brought them to the park to go on rides, the arcade and for a bite to eat. It was a brief trip but they loved getting away for a few hours. One particularly special day for me was the 1st of September. They held a ‘Back to School Concert’ where all the children who were returning to school dressed up and looked so smart and handsome. There was music and dance, speeches, and presents for the classroom. All the teachers from the local school and who teach in the orphanage had come for it and some family members of some of the children had come too. It was very special. I feel like my time in Cherven absolutely flew by this year. The apartment was very busy with a constant flow of volunteers to-ing and fro-ing. We crossed paths with some amazing student nurses who were travelling with Chernobyl Children’s Trust and their brilliant interpreters. While BCP was well represented with a small but mighty team! 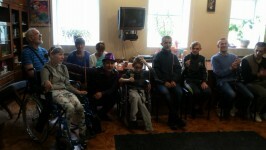 We spent a lot of time with group 6 taking them outside for walks in their chairs, giving massages and sensory play. There were some new faces in this group that were delighted to play and get some attention! We took a huge group on a trip to the disco and cinema. It was a huge success, they danced their socks off and played lots of games. We watched Horton by Dr Suess in the cinema and had made up little goody bags for each of them too. We also organised for a magician to come one of the days. He did a big show in front of loads of the children. We were delighted to get so many there from most of the groups. He had tricks, music and a rabbit and bird that caused huge excitement! We got to take some of the older boys out for an afternoon. This was a real treat because they’re normally working and don’t get to take part in all the activities. We took them to a restaurant for lunch which was a first for all of them and even ordered pizza – another first and they loved it! We took them all to the lake afterward where they relaxed and had fun. Saying goodbye never gets easier but knowing so much is being done and improved upon, year on year is comforting and encouraging and instils hope. I would like to thank everyone who made this trip so special. To our interpreters Irina, Veronica and Alena, everyone at CCT, Br. Liam, Tamara, Yuri, all the volunteers and all at BCP, thank you for all your hard work. See you all next year! Dobra Tut Fund is happy to announce that the Official Opening of Edel Smith’s House for Supported Living will take place in Yazovki Internat on Friday 18th September 2015. Many of the volunteer builders who helped construct the house are travelling to Belarus in the coming week to partake in the celebrations. Edel herself cannot travel due to the family circumstances but will be represented by her father John Smith and friend Pat Aherne. At the moment Yuri Kruk - the project manager is putting the final touches to this new development. 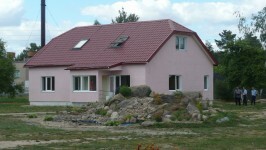 The house which has been mainly sponsored by Edel and her group Help the Cherven Orphans is intended as a home for some of the children from Cherven Children’s Orphanage with whom Edel has built a strong bond over the years. The Irish Ambassador to Vilnius will attend the official ceremony on Friday 18th as well as many important people and dignitaries from the Belarus side. Other Irish charity groups who helped fund and carry out this project will also be represented - Burren Chernobyl Project; Friends of the Children of Chernobyl, Killarney Chernobyl Group, as well as the builders from Athlone Chernobyl Group and the men from Roche Pharmaceutical Plant in Clarecastle, Co Clare who made several trips during the construction phase to continue the good work. More details of the event will become available as the week progresses. And we will post scenes from the Official Opening on 18th. We were asking you to help Sergei Luschin back in January. 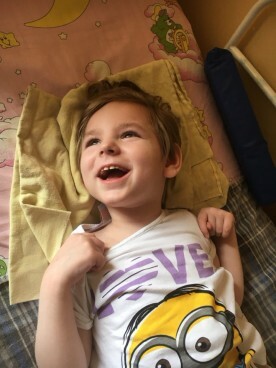 His mother shared good news with us that the boy has improved since the trip to China: he can sit better, head control improved alot, Sergei started to pronounce some sounds, and the MRI test said that he was getting closer to nomral. Surely they were offered another course of rehab to go on with successful treatment. Sergei was appointed to have another course on August 17, and the family was able to fundraise the required amount for the rehab on time, but in Belarusian rubles. Due to the growth of the dollar, it turned out that the family lost $ 3,000. So now they are asking all caring people to help gather the missing amount. The family is already in China, so we are in a hurry! 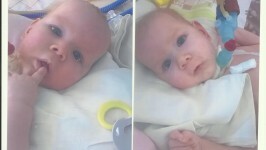 Please help this remarkable mother, who is trying to raise a son on her own! We are very happy… Happy that the children in our orphanages have a chance to welcome fantastic people from Ireland and not only. This visit was 6 years since my first trip to Cherven orphanage. I love travelling to Belarus and working with the children. Seeing the small improvements year on year makes it even better. This year in Cherven, I joined forces with another regular volunteer, Ruth Byrne, and a group of nursing students from Chernobyl Children’s Trust. Between us, we spent time with as many of the children as possible. We got the younger children out for supported walks in the sunshine, took the bed-bound children out in chairs, and put on lots of treats and activities for the full range of kids. This included a disco and cinema trip, a magician that came to Cherven and taking groups out for dinner and a picnic at the Lake. Belarus has become a big part of my life and the children are always on my mind. Throughout the year I fundraise with friends and colleagues and have been really well supported with donations. This year I loved giving out clothes, donated by students and staff at a local secondary school, for a wedding we staged in the playground between Lilia and Andre – a long-term couple in the older groups. The young men and women were ever so pleased and proud in their shirts and dresses. Getting to know the kids and their interests is a privilege. One evening I stumbled upon a group of the older boys watching the Dynamo Minsk V Salzberg match in the TV room. I enjoyed chatting football with them, even owning up to being a Chelsea supporter, and loved their reaction to the Dynamo Minsk goal – jumping up from their seats and high-fiving. The most important thing to me is that we volunteers give care, attention, and a little love to the children, which, with the ratio of staff to children, the orphanage doesn’t have the resources to give. The extra treats and trips out are great, but the time spent with a child who otherwise would be sat in a wheelchair all-day, unstimulated, is invaluable. I am already missing Belarus and can’t help but begin to think about my next trip! And we in the return thank Jennifer very much for all her help and attention. Looking forward to seeing you next year! We are looking for your help again! 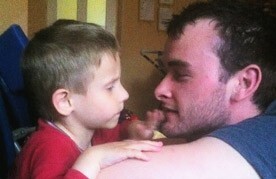 A lovely family of 2 gorgeous boys applied to us for help. They live in Petrikov, Gomel region. 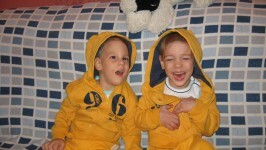 The twins Maxim and Vadim suffer from a genetic disease – spinal muscular atrophy. The boys urgently need a noninvasive ventilation unit “VENTIlogic plus” which costs 10 520 euro per set and they need 3 sets according to the specialists prescription that makes 31 560 euro for the family to pay! Please don’t pass this post by as every little donation can make a big difference in the quality of life for these children. All the attached documents are only in Russian, but you can contact the “Dobra tut” Charity or the family directly for more details (Mother – Savuschik Olesya, tel. : +375 29 1092263). 9004-р/charity account for Belarusian rubles. “This year marks my 9th year travelling to Belarus with the Burren Chernobyl project. I can honestly say that each year has gotten better, especially in 2010 when I was introduced to Cherven orphanage. My heart was split in two and can never visit one without going to the other. I spent two weeks herewith a lot of my time in group 3 and 4 and group 2 in the evenings. I felt my connection with the children had solidified, I am a face to them that keeps returning. I was , as always in awe of each and every one of them. The smiles, the laughter and the jokes warmed my heart. I was treated to concerts and even a salad making competition. It was a joy to spend my time in Goradischie and accompany them on outings away from the orphanage for the day. Due to the large group in Gorodische for my second week I moved into the independent unit. I was treated like a queen and no need for an alarm clock as a knock to my door at 8 am to say “ privet” would do!! A lasting memory I have is with Vitalik who lives in the independent unit. He can be seen as a tough man who plays sports and works hard, that is of course true but I was privileged to see his softer side. Every morning I would get a glass of juice to my room and every evening before I went to bed, he would come in and say goodnight to me. On the second last night he sat with me and was quiet. He said that he did not want me to go home, that my home was here now and I needed to stay. I held back the tears and gave him a huge hug, I felt helpless but I knew he understood. I left him with a present and a picture of us together in a frame. I spent one week in Cherven and managed to visit all the groups with a few ice cream parties along the way in the 34degee heat! I was also able to get 92 of us to the cinema and disco. It was great to see everyone out having fun and forgetting about the real world for a short time. I got a massive “spaseeba” and many hugs and kisses. A part of my heart remains with Tanya, it hurts more than is imaginable to say goodbye to her but I know we will spend time together again. Another life changing experience in Gorodishche with thanks to the Burren Chernobyl project. 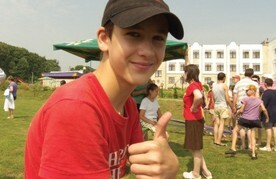 "This year I returned to Gorodishche orphanage for the second time. I must admit that I was slightly apprehensive to return this year having had such an amazing experience last year, I was unsure if this year could compare- I couldn’t have been more wrong. This years’ experience completely surpassed all of my expectations. Myself and the other volunteers were overjoyed to see the children being stimulated and engaged with on a daily biases, to see them outside with the sun on their faces and being treated with care and kindness by some fresh faces in the orphanage. It was also fantastic to see our donations and resources from last year being put to great use. This year we did a wide variety of things with the children which they, I and the rest of the volunteers truly enjoyed. On the first day of our trip, we visited each of the groups to reunite and reacquaint ourselves with the children. It is such an amazing feeling to see, hug, talk to, play with and spend time with old friends in Gorodishche and just as amazing to see the faces of new children and get to know them. One of my personal highlights of the trip was walking into group 5 and having beautiful Vika (who was previously in group 3) recognise me, run into my arms and squeeze me half to death with one of her loving hugs. Group 3 is always a difficult one to visit, especially when some of the smiling faces from the previous year are no longer there. Tears were shed and memories recalled of those children before moving on to spending time with the ones that remained. Although they can be one of the saddest groups to visit, I find that group 3 and group 4 are the ones upon which one can have huge impact, even in the space of a week. We fed the children, gave them massages, brought them around the grounds in their wheelchairs and allowed the sun to shine down on their faces and the fresh air to fill their lungs. We also fed them yoghurts, played with them and gave them the one on one attention which they love and crave so much. We also spent a lot of quality time with group 1. This group, which is primarily made up of young adults, loved being brought down to the gym where we played sports, danced and spent quality time with them. They also love to have their pictures taken and to take pictures of each other. 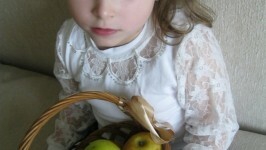 They were also fed nutritious yoghurts and enough sweets to last them a life time. Every evening at seven we would take the older boys from group two outside to play some football. Although the five Irish volunteers never stood a chance against the thirteen young men who we faced, it was incredible fun for all involved. Once we had suffered a mortifying defeat (every evening), we would feed the boys sandwiches and sweets before going up to the other boys from group two who did not like to play football and give them the same and spend some time with them. On the last night of our trip, we cooked up all the food that we had left in the house, bought bottles of coke and sweets and fed all the group 2 boys a feast fit for a king. The weather during this week was so amazing that we seized every opportunity that we could to take the children outside to let them enjoy the sun. We took the older girls from group 7 for a walk around the local village and took them for ice creams. We also walked to the graveyard where children of the orphanage are buried to pay our respects- a very sad experience but great to see that headstones had been bought with donations that we made last year so that the children’s graves are marked and they are remembered. We also made use of the fantastic weather by bringing the children on a day trip to a nearby town where we were given a tour, visited many sights and had a picnic in the forest. One of the boys said after the picnic that he had never eaten such wonderful food in all of his life which was truly heart-warming to hear. My personal favourite experience of the trip was walking down to a nearby lake with children from groups six and seven. On this day I was reunited with my best friend in Gorodishche- Andrei from group six. Such a pleasure to walk to the lake with him and help him learn English and try my very best (and fail) to learn Russian. Such an intelligent, kind, warm hearted, funny and inspiring boy who breaks my heart as he has so much potential and I know he would flourish and achieve in a mainstream school in Ireland. My heart broke even more when he asked if he could come back to Ireland with me and I had to say no (but I am hoping that this answer can change soon). We had a picnic with the children down by the lake but on this 37 degree day it was not long before myself (the biggest child of them all) and my partner in crime Andrei were in the lake splashing everyone. Soon everyone was soaking wet, laughing and having a great time. The week doesn’t take long to slip by and before long you are left with just a few short hours to say goodbye to the most inspiring, resilient, loving, caring and amazing people you have ever met and ever will meet. There is a lump in your throat and tears in your eyes from the moment you say your first goodbye, right up until you say your very last. Although saying goodbye to the children of Gorodishche is possibly the most difficult thing I have ever had to do, I would not trade my experience, my memories and the friends I have made there for the world. To those of you who sponsored myself and my fellow volunteers- your generous donations have bought a veranda for group three (who are immobile and bedbound) so that they may get out and feel the sun on their faces and fresh air in their lungs as opposed to lying indoors all day. This veranda will be built within the next month. One of the ladies working in the orphanage commented that she was so happy that the needs of these children were finally being met. We also put money towards building a drying room so that the children’s clothes and blankets can be washed and dried more easily during the winter and they can be changed more often. We bought tracksuits with elasticated waistbands which will encourage independent toileting and changing as buttons will not be an issue. We bought nutritious yogurts for the children, picnics, funded 2 day trips and bought presents such as watches, pencils and copies, teddies, etc. Thank you all for your donations. It is always our pleasure to listen to our volunteers' stories about their time spent in the orphanages. Every summer they have something new in store and always they are lovely memories. 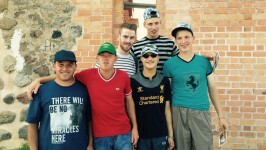 "I have just returned from a wonderful 3 week trip to Gorodishche orphanage. It’s such a privilege to be able to visit these beautiful children and young adults who welcome us with open arms. Over the 3 weeks we took part in a variety of activities and trips. We walked to the local library with “group 6” children, hand in hand enjoying the company and smiling faces – language is no barrier. Two of our children Andrei and Natasha read for us in the library. Afterwards we had ice cream and chilled out in the grounds of the local school. On our return home we walked past the church and graveyard we, the volunteers, were struck by the respect and reverence shown by the children. We also made 2 separate trips to Baranovichi taking groups of 20 children/young adults 1st group made up from Group 1,5 & 6. The second group from 2,6,7 and independent living. Most of the second group all have jobs and work hard, rarely getting a day off to be treated. We visited the fun fair & arcade followed by lunch and then ice cream in the park, lots of fun and happy faces all round. During our stay we bought yogurts and we gave these out daily to groups of children. Yogurt is always a very welcome tasty and nutritious treat loved by all. We were lucky to be able to join in the celebrations for “Ivans Day” which consisted of games, dancing and the older girls making floral head pieces with some help. Fortunately we had lovely weather for this and were able to take lots of children outside to the football pitch area for fun and excitement. Other activities we organized were discos both indoor and out door depending on weather, face painting and simple ball games. Everyone who had a birthday during our stay had it marked and celebrated with their friends. We volunteers just love the tradition of birthday wishes and the honesty with which they express them. We also helped feed the children in group 3. Of course I can’t forget to tell you about our evening football with the big boys who generally work all day. This was always looked forward to by them and some times the volunteers!! I can only speak for myself and say I have no football skills so quite often resorted to some very unsporting behavior! But all in all great fun was had and it was followed by bread and jam and juice! If weather did not permit us to play football, we would visit the boys in their group- playing cards, colouring, dancing/ listening to music and just hanging out, they just love company. Sometimes it’s enough to sit and hold a hand or listen to someone chat even if you understand very little. 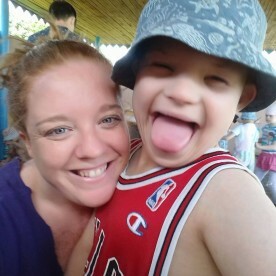 The one striking thing about these children is they are almost always smiling even if their day is spent in bed or restrained in a wheelchair as is often the case. In one group quite a number have to crawl along the floor to get from A to B still smiling. If they can find something to smile about why can’t we! Thank you to Burren Chernobyl Project, Dobra Tut and especially Irina and Tamara for their endless patience and support. Also a big thank you to our families, friends and community without their support we could not travel and help the children." And we in our turn thank all the volunteers of this group for coming back to our children to make a difference and lovely memories! The summer in Belarus plays tricks with the weather being very unpredictable, but it doesn’t stop people from Ireland coming to see the children in our orphanages. Gorodische orphanage is very popular this summer and welcomes groups of volunteers changing one another. But today this piece of news is not about them, we will tell their fabulous stories a bit later. Today we are going to tell you about two guys that are doing an incredible work with the children and the equipment both in Cherven children’s orphanage and in the families. These lads are our most dedicated volunteers. They are permanently involved into the Burren Chernobyl Project medical programme and visit Cherven and the community at least once a year. This time lads came for 12 days to do major job on the complex sitting systems for the most disabled children in Cherven orphanage and some of the community cases. The lads did a few trips to Minsk to put in place a chair for a beautiful little girl Angelina. They had been working on this chair for about a year and were delighted with good results. We hope that this chair will be of a great help to the parents and a big change in the child’s life! Some of the days were really busy with travels to Borisov to see Kolya, to village Hutor to see Andrei, Beresino to visit Vitya. And sure there was plenty of work in the orphanage itself. Late hours and hard work wore off our lads but as they always say it’s never enough. Never enough time to do everything and to see everyone they want. But we are very happy and proud to have such fantastic volunteers and assist them in every way we can. Thank you so much for those two great weeks that we had with you. Can’t wait to see you again soon! We welcome again the children from Gorodische children’s orphanage. This became an amazing tradition of Burren Chernobyl Project to take the children to Minsk and organize unforgettable holidays for them. It seemed that everything had to go its usual way, as everything was set up, repeated many times, but no – there are always funny moments, too much emotions and tears of course. In this group there were six children and a teacher, that were accompanied by Irish volunteers Maria and Julia, and Liam. We wanted to have a really entertaining week, so that the children would remember it a long time, as their world is restricted by the walls of the orphanage and they hardly have a chance to leave it for such a long time and a long distance, some of the children never leave the place. And I believe we managed. There were trips to the circus, Zoo, the amusement park, we invited a clown, bubble show, celebrated Lida’s birthday. She has already been on holidays in Minsk before, but now she turned into a beautiful young girl of 16 and became more reasonable and independent. Sometimes she was giving Nikita a lesson of good behavior using so called “pedagogical advice”. Nikita is a pure Angel (smiley and cheerful). He seemed as the quietness itself but overwhelming attention did its work – where else can you mess around?! It was “fun” for everyone – Liam, Maria, Julia, Irina and even myself. The children were selected from different groups but all of them were friends – older boys were helping Lida and Nikita as they were in the wheelchairs. It was probably the first time ever that Oksana has been out from the orphanage and so far away: you could tell how excited she was by the smile on her toothless mouth. In a few words we were all singing and messing and having parties and rest – the week flew as though never happened. We didn’t notice the time at all! And here came Saturday. Before children’s departure we went to see the aircrafts to the airport. Oksana was dragging her bag with belongings looking like about to cry – she thought it was time to leave. Yes the departure day is the saddest one, always comes with tears. For all the time of Minsk holidays I can only remember one group where no one cried – that were boys that work on the orphanage’s farm. They were tough, with no emotions and sentiments – real men! In the orphanage I called to see the children in Unit 4 that were on holidays in Minsk earlier – they came all asking questions and having small requests. Don’t know why it is always so painful to see Tanya. I think her condition is getting worse and Tanya’s body becomes motionless, it’s only her beautiful face that live a separate life. She lies there on the floor in such an unbelievable twisted position: her head leaning towards the wall and her body looks like a separate part. I want to pick her up and sit her but realize that it’s extremely hard for her. What an unimaginable pain has been suffered and is still suffering this girl (and not only her). Tanya wanted badly to come to us, but unfortunately we couldn’t take her this time. I promise to take her next time if there are any more groups to come, and she replies: “It’s ok Tamara, don’t worry, I’ll wait”. Shortly before they left I got a list of the names of the children for the next holiday week (made by the children)! God bless them! "On the 5th of August we are going for the surgery, and after that on the 10th we have to be in the clinic sanatorium for putting on casts to stretch muscles. Many thanks for the winter time period as there was 700$ tranferred to our account all thanks to your organization. Although this information is not provided by the bank we guess it came due to the information you spread. Thank you and your team so much and best wishes!" We also express our gratitude to everyone who donated towards the surgery! We hope to hear more news from the family soon!